FULL 3-DAY FESTIVAL REGISTRATION - Please register at this level if you are financially able. The New Story is about exuberant generosity, so we also ask everyone who can to consider giving more to enable others to attend. When checking out, please consider adding an extra $10, $50, $100, or more to help those who have to pay less. This will enable the festival to cover our costs so we can continue and grow in future years. FULL 3-DAY FESTIVAL REGISTRATION - We know that not everyone can afford $249 for a full weekend event, so select this option if $249 is beyond reach, but $179 works based on the resources you have available, the benefit you feel you'll receive from this unique gathering, and your desire to support the work of community, creativity, and the common good. FULL 3-DAY FESTIVAL REGISTRATION - We don't want money to be a barrier to anyone, so select this option if $179 is still beyond reach, but $99 works based on the resources you have available, the benefit you feel you'll receive from this unique gathering, and your desire to support the work of community, creativity, and the common good. FULL 3-DAY FESTIVAL REGISTRATION. Available for college, graduate, trade school, and seminary students. FULL 3-DAY FESTIVAL REGISTRATION. Please register for this no-cost ticket if bringing a child 12 or under. 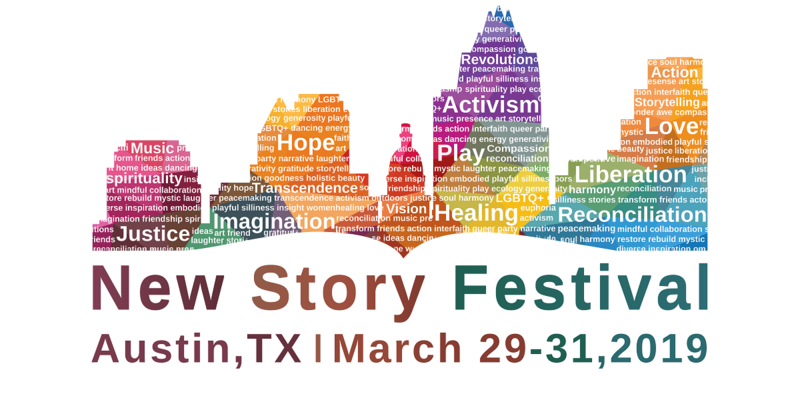 The New Story Festival is coming to Austin, Texas, March 29-31, 2019. A bold experiment for a better world - embodying creativity, spirituality, social action, and playful connection. The New Story will be filled with music, art, and stories, speakers and workshops, conversations both formal and spontaneous, helping us step into a better story – one with the potential to transform both Austin and the world. Standard registration for a weekend pass is $249. Please register at this level if you are able. We know that not everyone can afford $249 for a full weekend event. If that applies to you, please opt-in at a pay-from-the-heart price either of $179 or $99, depending on the resources you have available. We are not able to offer refunds. Tickets are fully transferable, however, so please feel free to pass along your registration to someone else, or consider donating it to the scholarship fund if you are unable to attend. Contact us at info@newstoryfestival.com to donate, or with any questions.